Social Media: Helping or Hurting your Job Search? Remember when you applied for a job, you would scan advertisements in the newspaper searching for a position that you were interested in? Then, you would submit a well-written cover letter and your resume to the address in the ad. If you were qualified, a recruiter or human resources associate would contact you as the next step to schedule an interview. If you were being considered for the position, the company would ask you for references. Once those references were checked out, and were to the satisfaction of the hiring company, they would then proceed by sending you an offer letter. Jump ahead to 2017: you see a job posting online you would like to apply for, you submit a resume immediately through the website, or apply online. A recruiter or hiring manager will review your resume and then do a quick Google search to see if they can find your social media footprint. They want to see: How searchable are you? Who do you know? What level of engagement do you have on social media? Can they get a read on your personality, will you fit into the culture at this company? Do your initial credentials check out? Are there any red flags that come up in your search results? Chances are all of this has happened before you even get a phone screening, so how do you strike the correct balance in managing your social media image? This article. Is your social media presence hurting your job search?, shares some great tips on how to navigate through your social media channels. As the Recruiting Manager at CC Pace, I am regularly giving advice on how to prepare for an interview. More often than not, it isn’t what a candidate says but what they do or how they present themselves can turn a hiring manager off to a candidate. 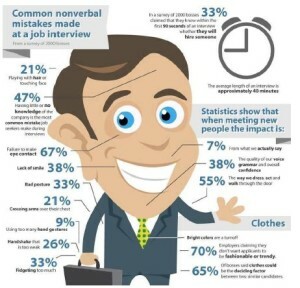 I came across a great image that illustrates some of the most common nonverbal mistakes made during a job interview. Some surprising statistics are 47% of candidates have little or no knowledge of the company they are meeting with – Wow. If you take one thing away from this, I would recommend that you take the time to do some research on the company and prepare. Enjoy the image and perhaps it will make you think about a few things that can positively impact your interview experience! Do you ever wonder what recruiters think when they receive and review your resume? At CC Pace we receive thousands of resumes each year. Some candidates apply online to our current job postings, while others are referred to us by employees, family members, and friends. Regardless of how we receive your resume, like most companies, it is added to our applicant tracking database that holds more than 50,000 resumes. So, how do you make your resume stand out when you’re applying for positions? How do you differentiate yourself in a competitive job market? What are recruiters really thinking when they review your resume? Below are some tips compiled from About.com’s Allison Doyle that may help you fine-tune your resume and assist you in making some impactful changes. Best of luck with your job search! To out distance your job-seeking competitors, follow this best practice... before writing your resume. Make a list of 10-15 (or more) mutual good-fit employers to target. Do research on them to determine what makes you uniquely qualified to help them meet their current challenges, for market intelligence, and to uncover relevant keywords and phrases. Use this information to create content for your personal brand messaging and career marketing materials (resume, biography, LinkedIn profile, etc.) that will resonate with those target employer. When applying for a position, prepare a cover letter that picks up 3 – 4 key qualifications listed in the job description and be very specific with regards to what you can offer pertaining directly to those qualifications. A career summary is recommended for most candidates, however there are exceptions. For instance, if you have less than five years of work experience or if you’re changing careers, you’ll want to have a one to two sentence objective statement. Your objective statement should describe the industry you are targeting. If you’re one of the many candidates that should include a career summary be sure that it is a snapshot of your work experience and offer insight into the skills and attributes you offer. A career summary will typically be in a block paragraph format and run about 3 to 5 sentences long. Each time, before you send your resume for a specific position, research the position and company (including speaking with current or former employees, if you can) so you have a better understanding of the goals and culture of the company, how the position fits within the organization, and the skills and qualities that are an ideal match for the position. Then, customize your resume to reflect the priorities emphasized by the company for this position, using language similar to theirs. This also means resisting the urge to tell them everything you’ve done and can do. Rather, look at your resume from the employer’s perspective. What do they need to know to be moved to contact you for an interview? Select the skills, qualities, accomplishments, and experiences that speak directly to their stated and implied needs. Ensure your resume is a forward looking document that demonstrates how your achievements are in alignment with results desired by the hiring organization. Do not write a historically-focused document that simply shows where you have been – show where you are going and how you will add value. The most important resume tip I offer is that you need to make the focus of the job descriptions listed on the resume a summary of what you accomplished and contributed in each of your positions. Employers are more interested in these than in what you actually did on the jobs. My second most important tip is to tell the truth. Yes, obviously you don’t want to lie about where you worked or what you did, but it’s the little lies that will trip up your application. Things like disguising gaps in employment by only using years or implying that you earned a degree – when you didn’t, give a potential employer a red flag about your integrity. Print job postings you’re interested in and highlight keywords. Are these words used on your resume? Transform your resume from a job description to a series of accomplishment statements that are of interest to the company by incorporating those keywords. Distribute your resume to close friends, family, and references and ask them, “Does this resume communicate my strengths and experiences in a way that will be interesting to the person interviewing me?” Friends and family can be excellent resources for pointing out strengths you have not recognized about yourself. Resumes used to feature a list of keywords to entice the computerized Applicant Tracking System (ATS). Unfortunately, a list of terms isn’t very enticing to human eyes and doesn’t differentiate a candidate from others with the same list of skills. Instead, use these same keywords as “headlines” for bullet items and give an example from your experience. Like this: Project Management: Initiated and implemented national merchandising program for big box retailer. Make sure your resume is online! Once you have your perfect document in place, update your LinkedIn profile so it matches, include your job information on Facebook and Twitter, start an About.me page, or create a professional blog for yourself where your resume information can be posted. When employers search for you online (and they will! ), it will be a tremendous help to make it easy for them to find the same information confirming what they’re reading on your resume. A resume should not be a laundry list of “stuff” you’ve done. It is a marketing document, and should directly address the target employer’s needs by including your specific skills and accomplishments. Before writing a resume, be sure to study job descriptions and collect as much information about organizations that interest you as possible. Then, you can make a clear case for why you are the perfect person to address and solve that company’s challenges. A simple rule with flexibility is that if you have more than seven years of experience, your resume should be two pages. With less experience, write a one page resume. Your resume should never be more than two pages. For people who are older or in areas such as Management Consulting, like myself, create a biography to retain everything you have done. Jay Martin, Chairman, JobSerf, Inc.
Career changers ask career coaches how to format their resume for a new position or industry but first it would be helpful to do something to signify to hiring managers that you are serious about the new career. Join the professional association, do relevant volunteer work, take a skills-building class. Any accomplishments in your desired career field are better than a beautifully formatted resume that lacks proof that you really know anything about the new career path. The best thing you can do with your resume is throw it out. That’s right: Don’t use a resume to impress an employer, because it won’t. Write a mini business plan for the job instead – and submit it to the hiring manager, not to HR, and not to some “applicant tracking system.” You don’t know the manager? Then you have no business applying for the job. The information you submit should be about the manager and your plan for fixing her problems – not about you. This approach is actually fun, because you must focus on one job at a time, which in turn means you must choose wisely, and meet the manager first. After all, isn’t that how you behave when you’re on the job?